With rising grocery bills and a number of ingredients in our food that I can’t even pronounce, I have made a big effort to start making more of our snacks from scratch, starting with these easy homemade granola bars. Not only does it ensure that I know all of the ingredients that have gone into it, but it has also cut down on our grocery bill by a LOT. 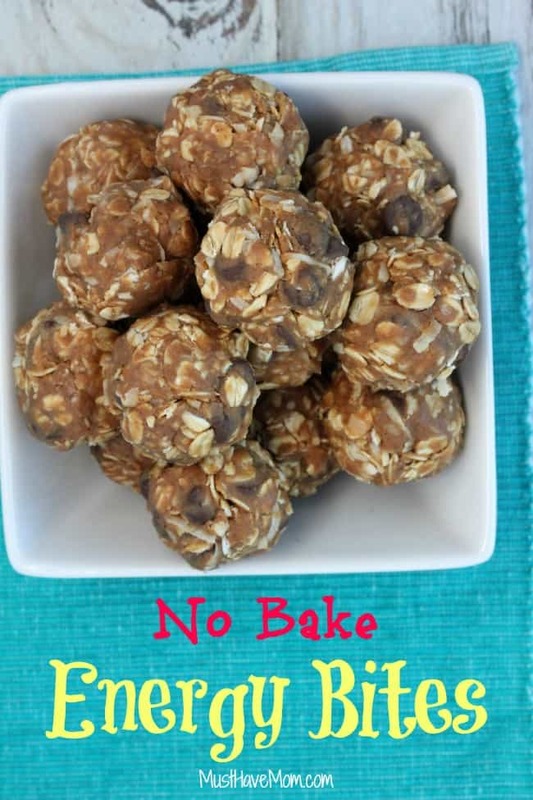 I’ll show you how easy it is to make your own homemade snacks too! 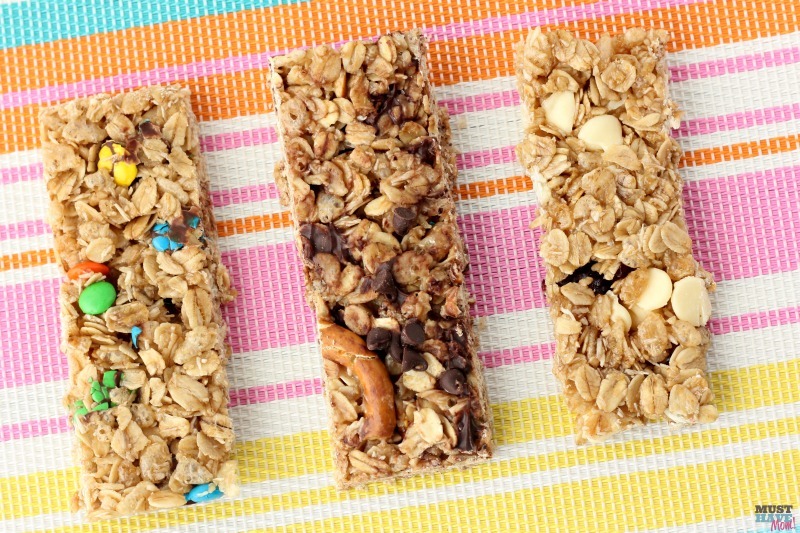 These easy homemade granola bars are healthy and very quick to make. They’ll also cost you a lot less than a box of 6 granola bars at the store does (and make triple that amount!). Making healthy food doesn’t have to be rocket science. We eat a lot of organic and non-GMO food and the price tag on a box of organic granola bars can quickly drive up the grocery bill. I now make 2 pans of these easy homemade granola bars every Sunday instead and we are set for the whole week. 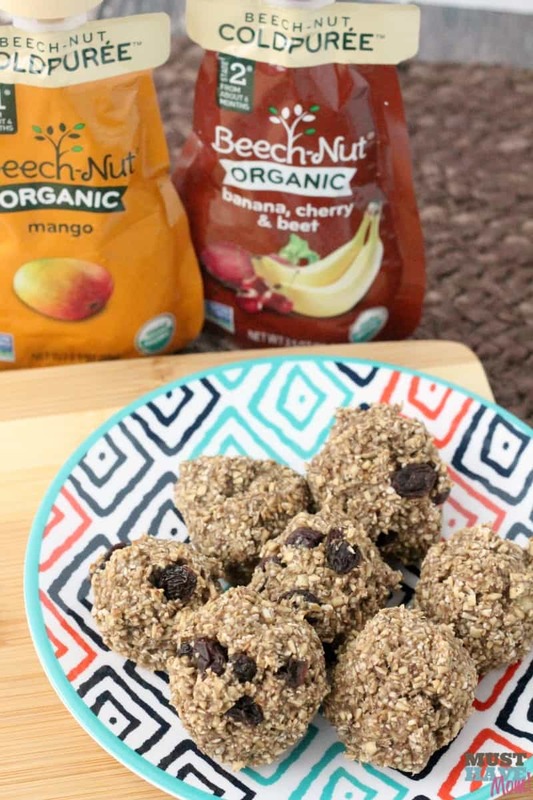 They are perfect for lunches or a healthy snack. They are a soft, chewy granola bar and not a hard, crunchy granola bar. For this recipe I use organic, unsweetened coconut, coconut oil, agave, organic rice cereal, oats, brown sugar, salt, vanilla and a variety of mix-in ingredients to create several different varieties. We live in a small town and often these organic ingredients can be hard to find. I always order them from Thrive Market instead as I’ve found their prices are better than my local stores and their selection is far better. 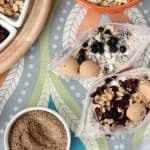 They carry all of these products for this easy homemade granola bars recipe so go order them now so you can be on your way to making your own healthy, non-GMO homemade granola bars! Need more incentive to order your ingredients now? With this link Thrive Market will give you an extra 15% off plus free shipping: https://musthavemom.com/thrivemarket and that’s on TOP of their already discounted products. You’ll get the best prices on these now and you don’t even have to leave your house! What I LOVE about these easy homemade granola bars is that you use this one base recipe and you can mix in a ton of different ingredients to get many different varieties! Make a whole 9×13 pan of one flavor or split it into two smaller square pans and make 2 flavors. I typically make these twice since we go through so many every week (with four kids!). To make these easy homemade granola bars, in a medium bowl mix together old fashioned oats, organic rice cereal and organic, unsweetened shredded coconut. Set bowl aside. Once you have stirred in your mix-in ingredients then dump bowl into a 9×13 pan (does NOT need to be greased). Cover with a piece of plastic wrap or parchment paper and press down firmly to pack them tightly. After doing this you can add a few more of your mix in ingredients (such as mini chocolate chips) to the top to make them pretty. Place in fridge for 30 minutes to an hour and then remove. Cut into rectangles. I then transfer them into snack size zip top bags for easy grab and go snacks. Store in the fridge. Keeps for 1-2 weeks in the fridge. *Note: these do not require refrigeration to stay good, but the refrigeration helps them hold their shape. I frequently send these in my children’s lunch or take one with me on the go. If eaten several hours later they will just be more soft and may fall apart easier. Print off the easy homemade granola bars recipe below! 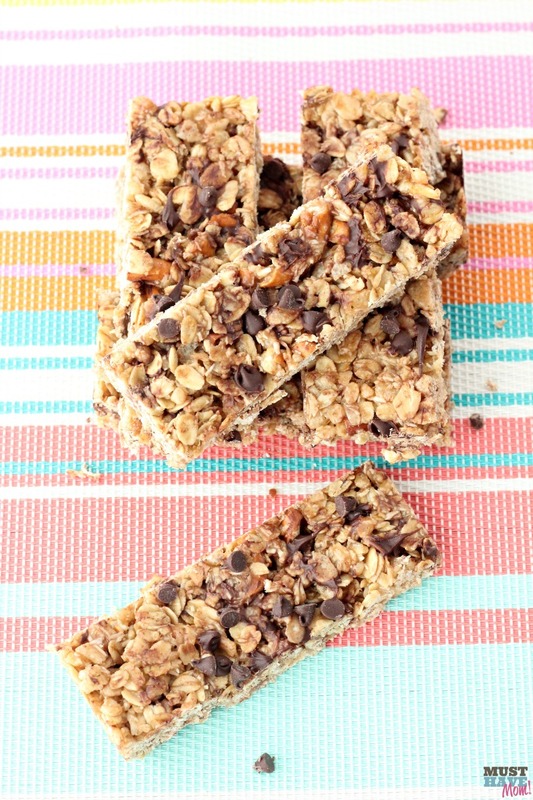 Easy homemade granola bars using healthy ingredients. Use this base recipe to make many different flavors. 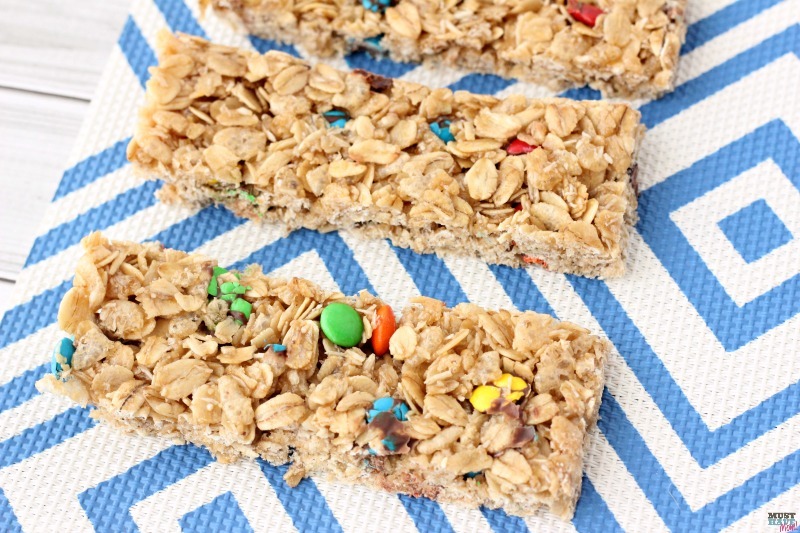 Soft and chewy granola bars that are perfect for on the go snacking! Mix together oats, rice cereal and coconut in a medium bowl and set aside. In a small saucepan add coconut oil and heat over medium-high heat. Once melted add agave, brown sugar and salt. Stir to mix together and then let sit until it reaches a boil. Once bubbles cover the surface of the mixture set timer to 1 minute 30 seconds and stir continuously. (*if using honey reduce time to 1 minute of gentle boiling) You may need to turn your heat down to low-medium. Maintain the boil but don't let it burn. Once timer sounds remove from heat and add vanilla and stir. Pour boiled mixture over oat mixture and mix together to coat oat mixture. Let sit for a minute or two to cool. Then add in your mix-in ingredients and stir together. Pour into a 9x13 pan (does not need to be greased). Place a sheet of parchment paper or plastic wrap over the top and press down firmly to pack the granola bars tightly into the pan. This helps them hold together better. Place in fridge for 30-60 minutes. Remove and cut into rectangles. I then transfer each one into a snack size plastic baggie for easy grab and go snacks. Store in fridge. Lasts 1-2 weeks in fridge. 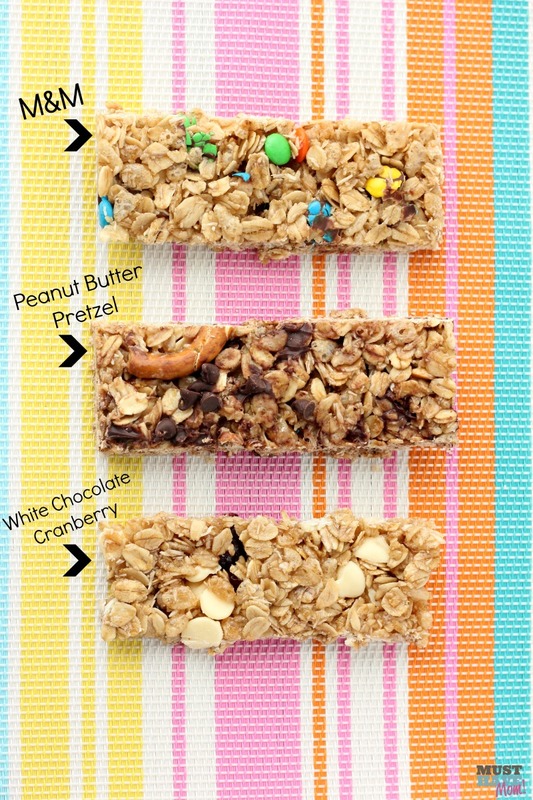 Be sure to also pin it for easy finding on Pinterest and share it on Facebook so your friends can enjoy these easy homemade granola bars and save on groceries too! 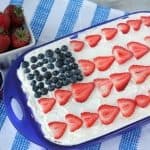 No Bake Icebox Berry Cheesecake Recipe Decorated With 4th Of July Flag! 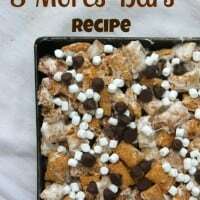 Smores Nutella Puppy Chow Recipe! 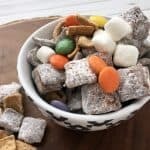 Puppy Chow Recipe Without Peanut Butter! I agree, the first time I tried a recipe for homemade granola bars I couldn’t believe how easy it was! And how easy it was to try different ‘ mix ins’ as you call them. Definitely a lot cheaper than buying bars from the grocery store, plus more fun since you can put in just what your family wants to eat. Great for car trips. Yes, they are so easy! I couldn’t believe it either. I love creating all the different varieties with one easy base recipe too. And you are SO right, they are so much cheaper than the grocery store! 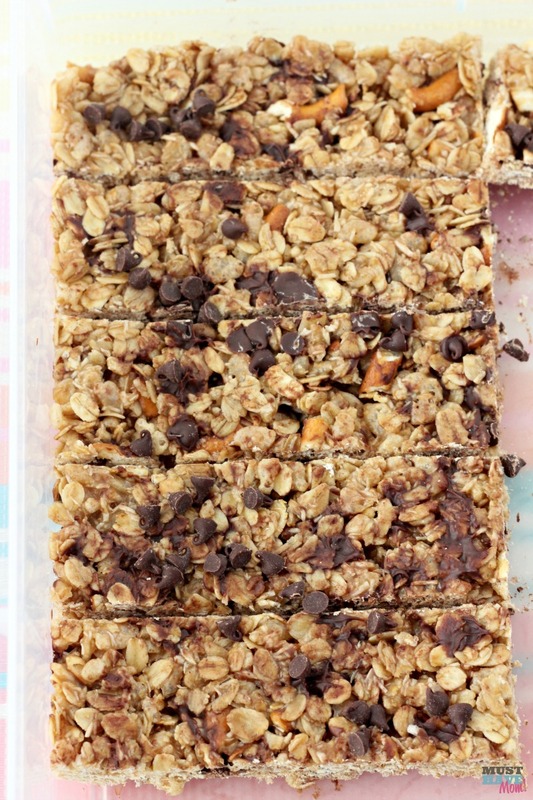 We love granola bars but have never made them ourselves. These look super yummy! They are surprisingly easy to make! Thanks for stopping by to grab the recipe. Let me know what you think Vickie! 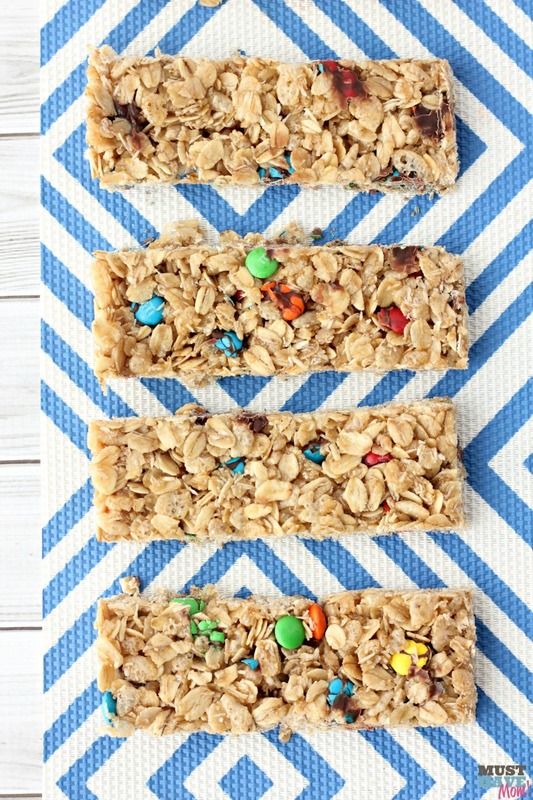 I love granola bars but never knew how to make my own. Thank you for sharing this recipe. They all sound delicious. You’re very welcome! Let me know what you think! Ok, so for whatever reason, my homemade granola bars never look this pretty! These look amazing and I am going to try this recipe. Yum! 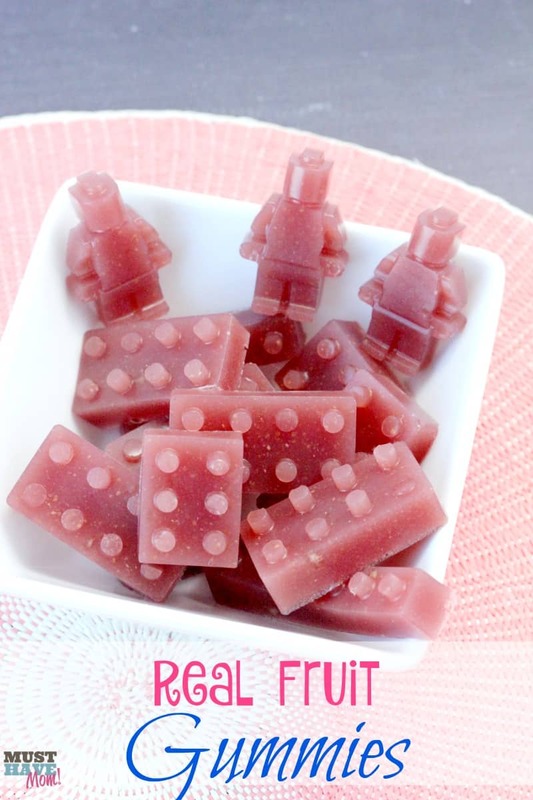 These sound so easy to make! Thanks for linking up with Merry Monday this week.